This is a short, shady walk through Tawa bush-clad hillsides. Signpost entrances on Brasenose Place, Achilles Close and Peterhouse St. Starting from the Brasenose play area, the track leads off to the right. It is a little uneven in places with tree roots on the track, but is otherwise well maintained with wooden bridges and steps. Archilles Close is about mid-way along (0.5 km), and Peterhouse St exit a further 0.5 km. About 120 metres up the track from Brasenose Place, the main track goes right through the bush. Another track continue uphill, eventually reaching the Airstrip. This is quite a trek uphill and not well marked near the top, but affords some good views of Tawa and Churton Park. 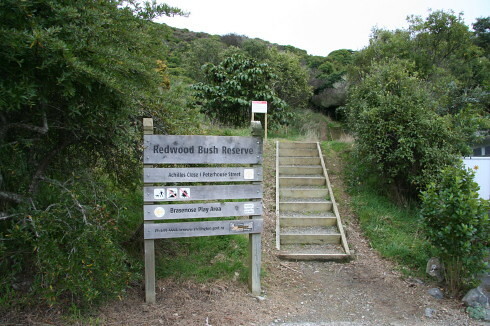 The upper bush track leads off to the right from near the style above the main Redwood Bush track. The first part of the track is well formed, but the last section which climbs up the hill and emerges onto the Airstrip track by the fenceline is steep and slippery after wet weather. The track is used primarily for pest control and is rated "intermediate". From Brasenose Place, Achilles Close or Peterhouse St in Tawa.